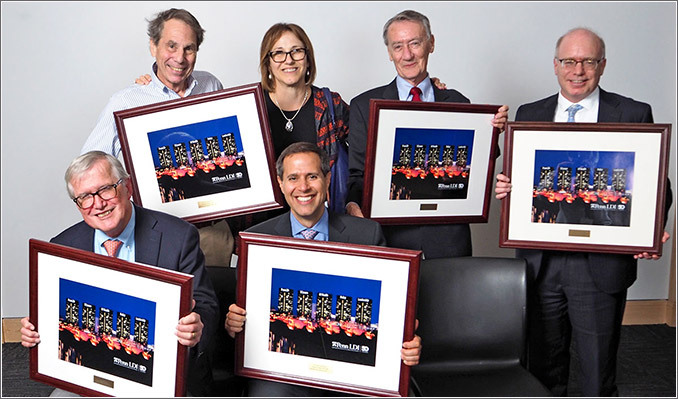 The five most recent executive directors of the Leonard Davis Institute gathered in 2017 to be presented with framed photos of LDI's 50th Anniversary announcement running on the center city PECO building's Crown Lights banner. [Top row] J. Sanford Schwartz, MD, (1989-1998) Penn Medicine Professor; Joanne Levy, MBA, MCP, LDI Deputy Director; William Pierskalla, PhD, MBA, (1978-1983) Professor Emeritus, UCLA Anderson School of Management; David Asch, MD, MBA, (1998 - 2012) Penn Medicine Professor and Executive Director of the Penn Medicine Center for Health Care Innovation. [Bottom row] Mark Pauly, PhD, (1984-1989) Wharton School Professor of Health Care Management; and Daniel Polsky, PhD, (2012 - 2018) Wharton School Professor of Health Care Management.